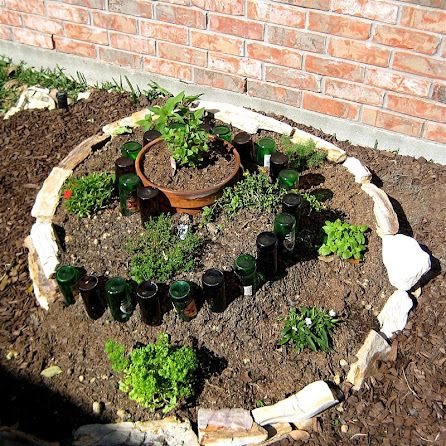 I'm doing a "Happy Dance" since today I finally made a spiral herb garden! 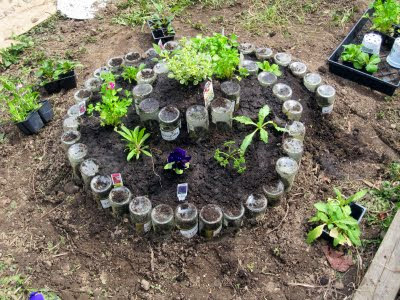 I had seen several versions of these garden designs on Pinterest last year and decided to start collecting green and brown bottles (and having friends collect them for me) to use in making mine. petrified wood pieces to complete the design. 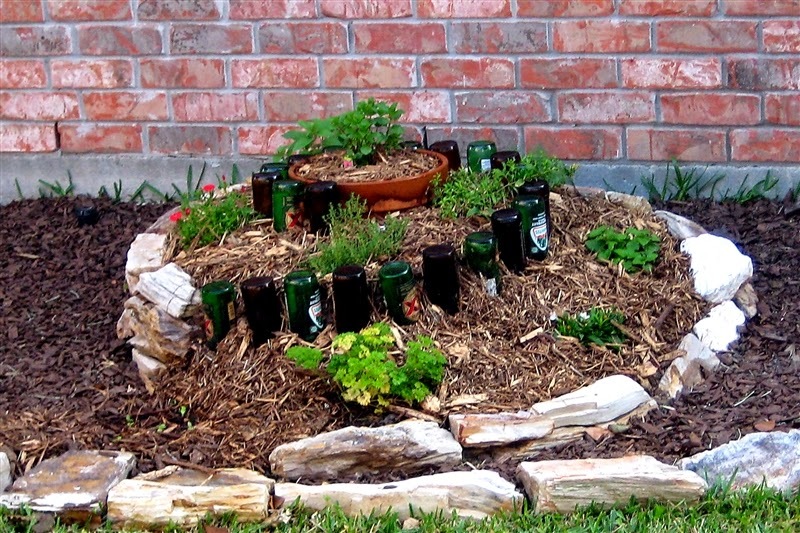 It was a fun and easy project and can be finished in a day - provided you have been saving your glass bottles instead of recycling! Here are some progression pictures of how I made this. If I can do it - anyone can! 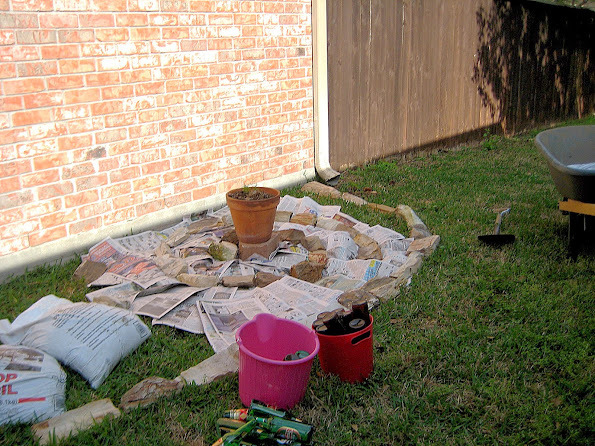 2nd - put down newspaper or cardboard, overlapping it at the edges to kill the grass underneath. 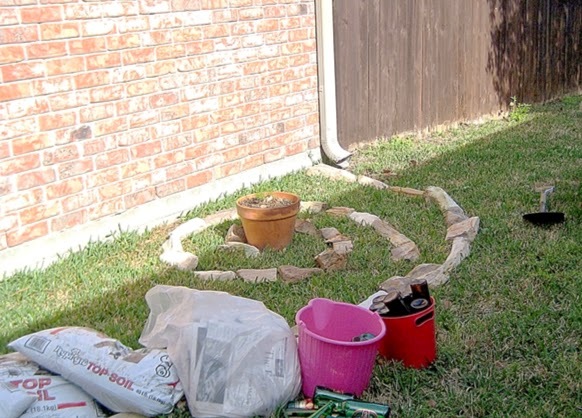 You could use a shovel and take it out, but the cardboard works and saves lots of time! 3rd - I used a large clay pot planted with mint for my tallest center planting. The pot should help keep the mint from over-spreading it's bounds. This pot was set on top of another brick, to give it the extra height. I've heard that the height should be about the same distance as the width of your design. 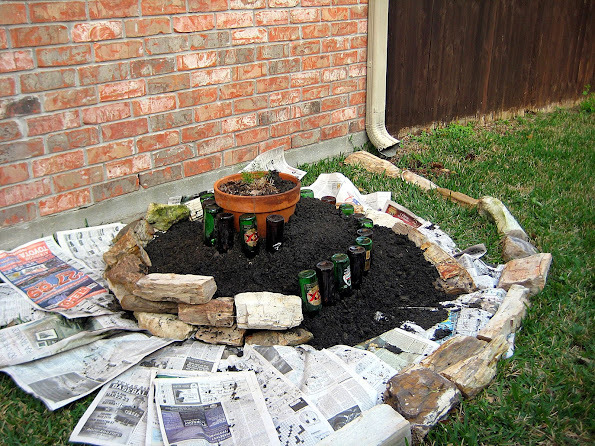 4th - Begin adding dirt to build the walls, reinforcing them with the stone or bottles. 5th - When you are happy with your design, add plants! Mine was planted with spearmint, tarragon (Mexican marigold mint) which has cute little yellow flowers, dianthus (for added color), dill, lemon balm, curly leaf parsley, basil, and thyme.